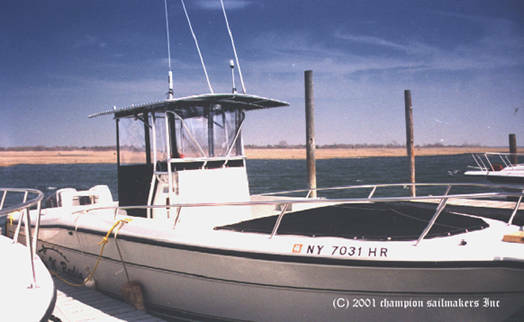 Above is a 1994 25' Stamas Center Console boat with a factory installed T-top. It shows a very popular 3 sided 'Box Enclosure' made with heavy optical clear vinyl windows. 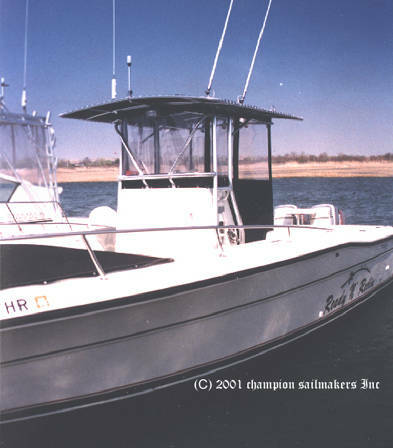 It was designed with removable, sectional panels that allows the boat owner to be prepared for a variety of weather conditions. The aft side sections can be rolled up to allow free movement around the boat. Also, there is a heavy zipper located behind the sway braces allowing the front to be opened in the event that it get too warm. This also minimizes marks that might form on the clear vinyl caused by coming in contact with the aluminum bars. Designed for safety, the enclosure sections are located behind the aluminum framework for the T-top. This gives passengers that are walking around the boat something to hold on to. If ever you have been in ruff seas, you can appreciate this important consideration. A back section is offered as an option but not always needed. Many times having front and side protection is all that's required. This boat was delivered to a local dealer from the Stamas factory when it was new. Aside from the T-top, no other canvas was ordered so the customer could have the boat 'his way'. In this case, the owner needed more storage than the boat had, so he had me make a custom bow cover that covered the casting deck platform. That solved his storage problems.